Have you seen this? Wooden stools are being used as creative shelves and pedestals through the home. 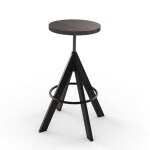 The stools display items at an intriguing height, drawing the eye to a level of space that’s not often used. They also let you display items in open space to create a gallery feel, rather than against a wall. Why use stools as shelves? Stools are easy to move, so you can change the location of your display piece any time. They also work double-duty, serving as backup seating for when you entertain. 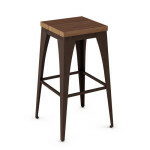 Stool pedestals help save your walls, too—no need to install shelves or break up sight lines. Flowering plants, cacti and succulents look beautiful, and you can move the stool to follow the sun. Books between bookends is another idea. Small sculptures and art objects also fit well, especially pieces that are too small for their own wall shelf. 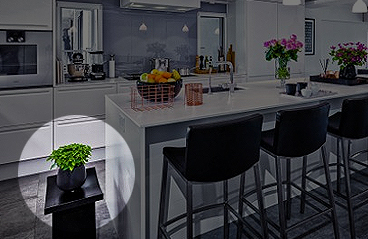 In the first picture seen here, a saddle stool holds a potted plant in a minimalist Scandinavian-style kitchen. 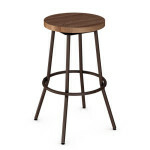 If you have a spinning stool, you can choose items that gain intrigue from rotation. These include all sorts of abstract art, swirling sculptures, colored glass works and such. You don’t have to constrain your display to single items. Scattered, tiny objects work well too, like polished stones, figurines or glass trinkets. 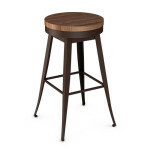 Go for stools without backs or arms. 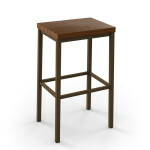 The ideal stool will have a flat seat, either rectangular or round. Slightly curved seats work for soft-bottomed items. If the seat has a curve, you can flatten it by laying down a padded cloth or textile trivet. Then, set your flowerpot or other hard item on top of that. For artworks and other items with small footprints, it’s best to have a perfectly flat seat. How would you use display stools in your home? Visit our Facebook page and let us know!